I find this story interesting, not exactly sure why. Drew ... this is the guy you mentioned in an email, and I wrote to you about last night. As I mentioned to Drew, I do not understand why we held him for 13 years if he wasn’t finally charged with something. I’m always to be found defending or cutting tons of slack to our intel agencies, even tho of course they can make deadly mistakes. But guys, who else aside from the help of our regular police depts. stands between us and the bad guys? And on an international level especially when dealing with the threat of terror groups, shouldn’t we assume our ppl at the FBI and CIA and NSA have information on various groups and individuals that we just can’t even imagine? While we all want an open society, and I am not always sure what that is, as it seems to change a lot. But there are just things those agencies have access to that for reasons of state safety, if we were allowed to know, then the scum that want to destroy us and our way of life will know as well. I think it comes to the fact that a general won’t send word of his plans to his foe. OK so, this guy has been held for a long time, and some papers here and most especially the Daily Mail, have been on a holy crusade to free. They keep harping and banging on about America’s poor image and how our system is violating intl. laws, blah,blah and blah. He has been called the last Brit to be held by the USA at Guantanamo. Well friends, he is no more a Brit than I am. He was a resident of this country just as I am. But the Mail likes to make things local and what better way than to claim he’s a Brit. Last week he issued a statement, thru his lawyers of course, that if he should die before release, it means the Americans have murdered him. And he wants the world to know that. To listen to this guy, or read his statements, you’d think his life was lived in a cage with no access to other humans. Ok, the cage perhaps. The thing is, based on what’s been coming out of Guantanamo, he sure as heck has someone speaking for him or passing on his statements. or Obama in particular, into freeing this guy, who says he is being held because the Americans are afraid of the secrets he knows and afraid that word will get out how badly treated prisoners are. All of them. maltreatment of prisoners by the Americans. If British agents like say MI5 or 6 knew, the government had to know. Look for a future lawsuit against the UK, once he is finally let go. I can believe torture was used at some point. But why do we hold on to a prisoner, give dates of release and then backtrack. If he really is innocent as he claims, wow. 13 years is a long time to be held a prisoner. But then, wouldn’t he say he was innocent anyway? The last ‘Briton’ in Guantanamo Bay has given the first detailed account of how he was tortured in the presence of British agents. Shaker Aamer says his head was repeatedly slammed against a wall while a British officer was in the room. On another occasion, a young British officer in a red beret visited him in a ‘cage’. Both alleged incidents took place on US bases in Afghanistan shortly after his 2001 capture. Mr Aamer’s account is one of the most serious allegations levelled at the security services for ‘complicity’ in the CIA’s notorious torture programme. Lawyers for Mr Aamer – who has been held at Guantanamo Bay for 13 years without charge or trial – say the 48-year-old British resident is being denied freedom to keep a lid on his claims. But he was allowed to tell his story to a doctor who examined him last year and she has quoted him extensively in her medical report. He was allowed to tell his story to a doctor who examined him last year and she has quoted him extensively in her medical report. Mr Aamer’s medical report was commissioned by his lawyers and lodged with a federal court in Washington in April last year as part of a motion calling for his release due to his ill health. Mr Aamer has been cleared twice for release from Guantanamo but has yet to be allowed back to South London where his 40-year-old wife and four children live. Born in Saudi Arabia, he moved to London in 1996 and worked as an Arabic translator. Granted UK residency, he married a British woman, Zin, who was pregnant when Mr Aamer was captured in Afghanistan in 2001. 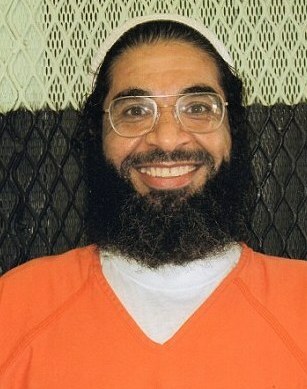 The child, a boy named Faris, was born on the day Mr Aamer arrived at Guantanamo in 2002. By 2007, a classified US military report had concluded Mr Aamer was a ‘close associate’ of Osama Bin Laden and a ‘recruiter, financier, and facilitator’ for his Al Qaeda terror network. He says he was simply in Afghanistan doing charitable work, and was sold by locals to the CIA who were offering $5,000 bounties. Mr Aamer claims he confessed to being a jihadi to end his torture at a CIA ‘black site’ on the Bagram US airbase in Afghanistan. Previously, alleged British complicity in torture has led to payouts of £1 million each to other Guantanamo inmates such as Binyam Mohamed, who was released in 2009. But Mr Aamer has festered at the notorious camp longer than any of them. President Barack Obama pledged to ‘prioritise’ the case in January, but nearly six months on he is still behind bars. The Daily Mail has long campaigned for the closure of the inhumane Guantanamo prison and has championed the release of Mr Aamer. The Mail has described Mr Aamer’s incarceration without trial as an affront to justice and called for his release as a matter of principle in a right-thinking democracy. In a comment article last month, we said: ‘This paper has always accepted that Aamer may be a bad man. I’ll tell my mama on you. Has made her baby oh so blue.